A business impact analysis (BIA) predicts the consequences of disruption of a business function and process. Its purpose is to collect information needed to develop recovery strategies. Potential loss scenarios are be identified during a risk assessment which is dependant on the BIA assessment. Operations can be interrupted by the failure of a supplier of goods or services or delayed deliveries. There are many possible scenarios that need to be assessed. Business continuity focuses on keeping the business operating. Where disaster recovery tends to deal with systems and data, business continuity is focused on overall business operations. 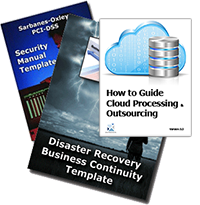 Typically business continuity involves prioritizing various business processes and recovering the most important ones first. Thus, disaster recovery is focused getting the entire IT infrastructure back up while business continuity is more likely to work on getting the parts dealing with critical processes like transaction processing operational as soon as possible. Business impact analysis supports business continuity by attempting to decide which processes are the most critical to recover in case of a disaster. This usually involves assigning monetary value to the protection of assets involved in specific business processes. 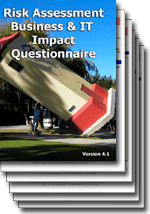 The Business and IT Impact Questionnaire is delivered electroncially in MS Word and PDF formats. 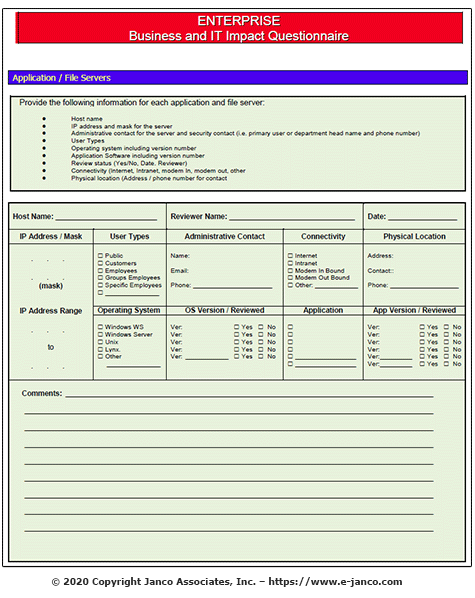 Below is page one of two pages for the File Server assessment form. 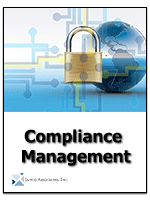 The typical organization has hundreds of applications all at different recoverability capability. For example some have no plan, some have out of region architectures some have not exercised in long time and some are in great shape testing every quarter. All of the applications need to be categorizing them so that the Disaster Planning Team can start re-mediating the ones that place the enterprise at the most risk to the business from both a compliance and readiness perspective. Using the ITIL framework, you can weigh each Critical Success Factor (CSF) and scoring their Key Performance Indicators (KPI). That allows you to create a rating system and developing a score card report by tiers.